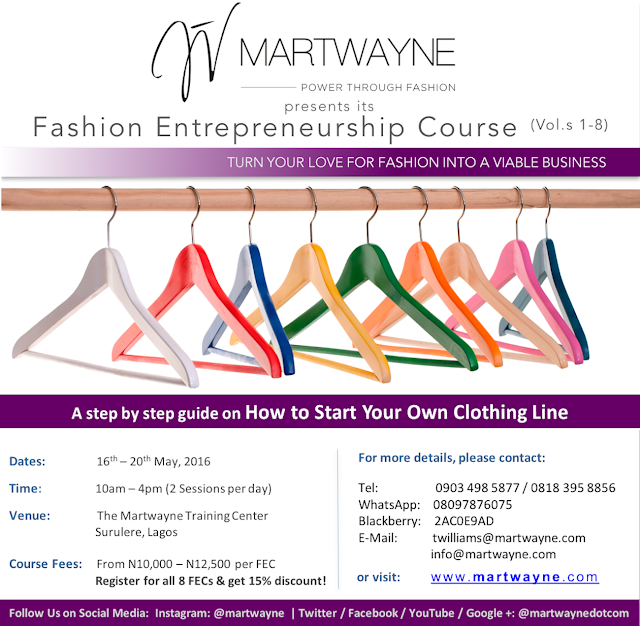 Martwayne | Power Through Fashion: Reasons to Register for Martwayne's Fashion Entrepreneurship Course (FEC) starting 16 May 2016. 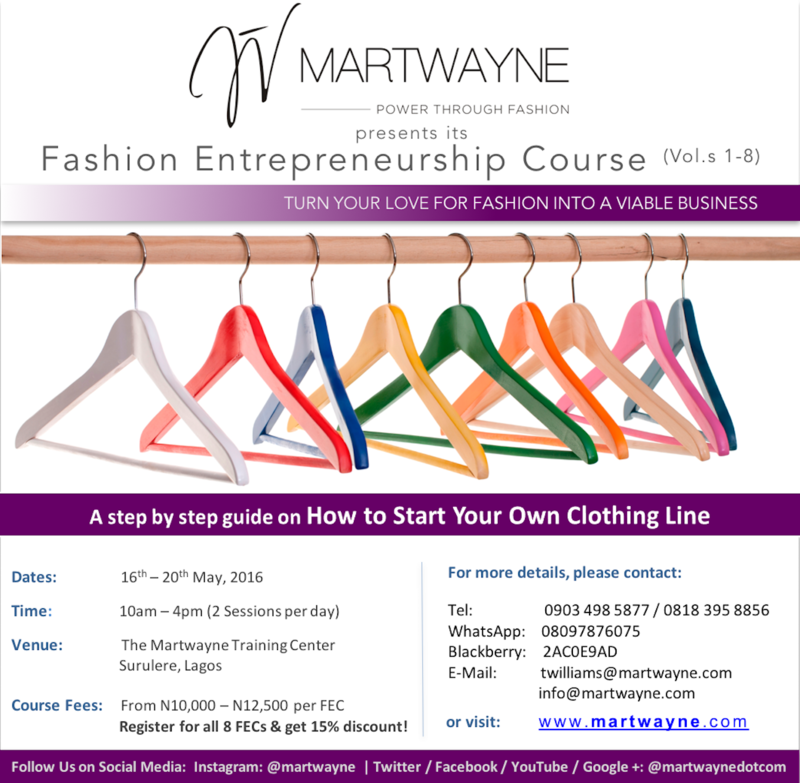 Reasons to Register for Martwayne's Fashion Entrepreneurship Course (FEC) starting 16 May 2016. So I was on Facebook the other day and stumbled upon a post in a Sewing Group I belong to which I found very interesting. I very direct, straight to the point post on the importance of knowledge in starting a business, I thought it would be very interesting to share it on the blog. I did ask for permission though, in all honesty, the poster did say it did not originate from her. So if you did write this, here I am also asking for permission and giving you the credit for it! "One of the most potent keys to financial independence is KNOWLEDGE.... For instance, with regards to getting paid jobs (which I never advocate as the only source of income), it has been shown that the more educated you are, the higher your chances of getting a good job as well as good working conditions. No matter how Intelligent you are, your chances are lower compared to a bachelor degree holder, if all you have is a secondary school certificate. However, I don't intend to focus on formal education today. Let us talk about skills. So you have a fantastic drive to make clothes and you believe you are naturally gifted? Wonderful! The truth is that you won't be as sucessful as another person who is gifted but also decides to attend a fashion school to get more knowledge. Even after learning well from the fashion school, to successfully run a business, you will find a short course in business very helpful. Ask those who have really tried it, the difference is always clear. This is mainly because they teach them, asides other things, how to package the business to look attractive and how to manage money and grow it. Your natural talent may not package a business for you. I used to work in a clinic I consider to be one of the best private clinics in Nigeria in terms of organisation and quality of service. I was however shocked when my boss returned from a business course one day and said her business would have been much better if she had attended the business school earlier. Trust me, she was making money prior to this time but the education she just got made her see newer ways and that was the beginning of a successful repackaging. If you are really interested in starting that business, get some education, speak to a consultant, learn business management, sharpen your skill set, start with quality even in the absence of quantity. #practicalchristianity". Well...... what do you think?! Agree or disagree?! Well I agree 100%! In fact this was the reason we launched the Fashion Entrepreneurship Course. We constantly get questions from designers about their fashion businesses and we realised that most of these issues either stemmed from a lack of know-how or the fear of implementing processes in their businesses. Many have attended our FECs in the past and have attested to how relevant and helpful it has been to their business. And I can guarantee it will help demystify many things you have been having challenges with - from diversifying your fashion business to how to set a proper price point for your products and services. So why should you register for the Course?! Simple! Each of our topics addresses a specific area in the process involved in starting a clothing line. FEC 1 deals with understanding the Fashion Industry and its Various Income Streams. Often times, many designers are offering services they do not even know they should be charging for. Others may not even know they already have the knowledge to carve a specific niche for themselves in the Industry so this FEC addresses that. It also gives a snapshot of the design and production process which is vital so you know what exactly it takes to design your own clothing line. FEC 2 teaches how to develop your ideas from scratch as well as communicating them to your tailors and other members of your production team. Often times, I tell designers, chances are it may be their fault that their tailor keeps getting their designs wrong so it is important of you to know where the mistakes are so you avoid them and that is what this FEC is about. FEC 3 is all about colours and fabrics, how to know which colours work together and which fabrics work for specific clients based on their properties. FEC 4 is all about what you ned to start your production unit if you plan to set up your own factory. FEC 5 deals with how exactly to generate funds from within to move your fashion business forward or save enough money to start yours. FEC 6 deals with how exactly to charge for your clothes so you not only cover your costs but make a profit on the clothes you make. FEC 7 deals with how to put the structures you need into your fashion business so people respect the fact that you actually run an institution and you also satisfy regulatory requirements. FEC 8 deals with how to deal with those customers who give you a whole lot of headache in your fashion business, what you are doing wrong and how to tackle these issues professionally. Days with 1 session only start at 12 noon while days with 2 sessions start at 10am for the first and 1.30pm for the second. To register for the FEC of your choice, simply pay/transfer the fees for the specific one(s) into the "Martwayne Dynamiques" account, 101 411 8569 at any Zenith Bank branch. Please, where in surulere is your office located?